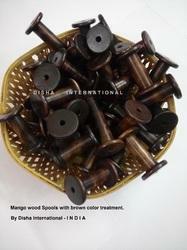 These beautiful spools are made from MANGO wood and colored brown which looks stunning. They are perfectly polished with its original lustre. They can be made in any size as required by the buyer. We are ahead of our competitors in manufacturing and supplying a wide range of Wooden Spools. These find their wide application in various fabric industries for the packing of winding wires and fabrics. Our products are manufactured from optimum quality raw materials and acclaimed for their lightweight and eco-friendly nature. We are the leading manufacture supplier exporter of Wooden Spool and offer this product as per client requirment and i am looking for foreign inquiry . Our company is involved in manufacturing, supplying & exporting of fine quality of Wooden kite spool. Being the most respected organization guided by experienced and knowledgeable professionals, we provide an enormous assortment of Plywood Spool. The offered spool is manufactured under the surveillance of trained professionals using optimum grade wood with the help of contemporary machines in compliance with set industry norms. Our company offers a wide range of Wooden Cable Reel / Drum in various sizes. These drums are normally used by cable and conductors manufacturing units. These drums are strictly manufactured as per the requirement of the customer. We have marked a distinct and dynamic position in the market by providing a quality assured array of Wooden Drum Reel. This is cardboard spools is made of carboard sheet tin tube. this spools is used for light wires, alarm wire , drip irrigation sysytem. Being one of the reputed names of the business, we are involved in offering superior quality Wooden Spool. We are in core manufacturing business of Wooden Reels in Maharashtra. We at Shiv Shakti Timber Mart offer wide range of Wooden Reels as per the Industry requirement. There reels are normally used by the cable and conductors manufacturing company. Our company offers a wide range of Wooden Cable Reel / Drum in various sizes. The sizes vary from 450 mm to 3050 mm flange diameter. These drums are normally used by cable and conductors manufacturing units. These drums are strictly manufactured as per the requirement of the customer. With enriched industrial experience, we have been able to offer a wide spectrum of Spool Roller. 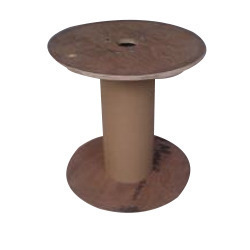 With maximum strength and surface smoothness, this Wooden Cable Reel is intended for packaging of cables. It keeps the cables in the well-mannered form.